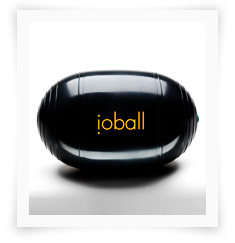 The new io-Ball offers a complete and specially health-oriented solution for all training-levels. The very compact fitness equipment is used in the latest toning-workouts, spinal courses and is used in many wellness hours. Because of its small size and the many different training variations the io-Ball is suitable for home and balance training in the office. The io-Ball with its unique elliptic form is a fitness equipment which was developed completely new. The flexible surface is thin, resistant and has an extreme resonance. The fitness equipment has only 150 gram and has a very good grip at its surface. Our extensive research produced the ellipse form, an excellent basis for most varied and at the same time effective training. The changing volume of air inside the form is distributed efficiently and makes maximum feed-back values possible, which build the key to the success of this new training method - which is the io-Training. The maximum weight is at 100 kg. At normal trainings this maximum weight of the body wont be on the io-Ball. At the io-Training one should be sure not to use any rigid and sharp equipments. But don’t worry – our specially developed fitness equipment is not just a sensitive balloon! The quality safety is at first place and the quality standards of the known Staby fitness equipments will also be found in the new io-Ball – of course "Made in Germany". The io-Ball as a whole is a new way in the area of fitness equipment: compact, cost-effective, variable in its use and specially effective – you reach more in shorter time. To experience the io-Ball live, visit one of our Events, attend one of our trainings or look at our io-Ball Videos. The design of the io-Ball does not end at the form or function. Its neutrality of the smell is a special characteristic which is very important when producing our fitness- and wellness equipment. The colours and materials we are using do not produce smells or skin irritations. The overwhelming success of the deep-black coloured io-Ball is completed by the very technical design. 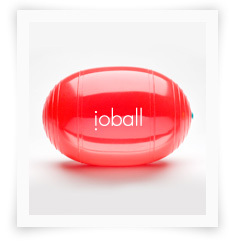 The new colours "red" and "yellow" are specially bright and demonstrate the ease of the io-Ball training visually. Give your individuality a special character and choose the colour which is suitable for you. io-Ball and Staby are a really difficult team to beat when it comes to your fitness. Both fitness equipment together are an optimal solution for a complete and very healthy fitness training. This is already converted in the new Cardio-Core trainings system. You can use it now too!